Triage is the in itial assessment and sorting of casualties based on medical need and likely response to treatment. In a multiple-casualty situation, triage is essential to effectively sort casualties and prioritise their order of treatment to ensure that the greatest good can be done for as many casualties as possible. 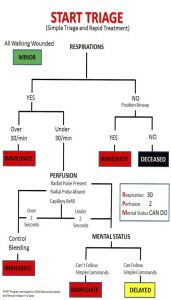 Triage is initially performed to assess and apply priority in 30 to 60 seconds per casualty. This allows rescuers to allocate correct resources using minimal time and segregates casualties into groups, which allows rescuers to organise themselves and resources. There are a variety of triage systems in operation across the world. One of the most common tools is the START triage system. The START system (Simple Triage And Rapid Treatment) classifies a casualty’s treatment category from an assessment of their respiratory (respiratory rate), circulatory (capillary refill) and neurological (ability to obey simple commands/ functions).